When Bella Swan and Edward Cullen first sat next to each other in biology class, an entire generation of moviegoers simultaneously swooned and the young-adult vampire-romance based on the best-selling Twilight novel by Stephenie Meyer, became a worldwide cinematic phenomenon. To celebrate the film's 10th anniversary, Fathom Events and Lionsgate's Summit Entertainment, are inviting fans to return to Forks, Washington, when Twilight comes back to movie theaters nationwide this October. 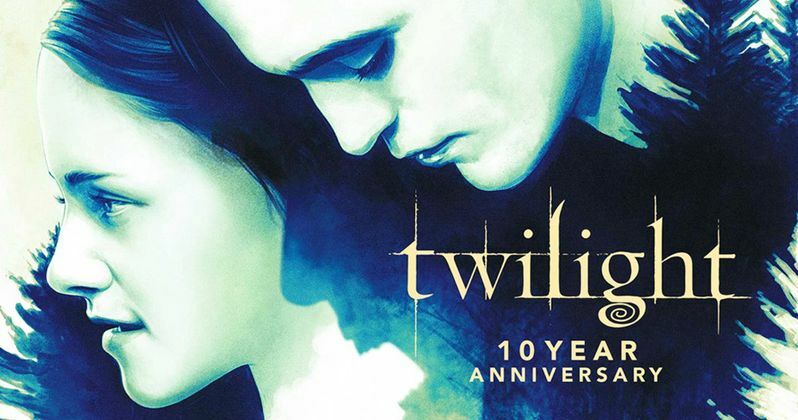 This unforgettable experience will also treat fans to an introduction by director Catherine Hardwicke and an exclusive sneak peek of the brand-new special feature "Twilight Tour...10 Years Later," from the upcoming Twilight 4K Ultra HD home entertainment release, available October 23, 2018. Twilight is the first title of the "Fathom Spotlight" series. This lineup will showcase contemporary blockbusters, modern classics and fan-favorite films back on the big screen including newly enhanced digital versions. Twilight will play in more than 450 movie theaters nationwide Sunday, October 21, and Tuesday, October 23, at 2 p.m. and 7 p.m. (local time). Tickets for the 10th-anniversary screenings can be purchased online at twww.FathomEvents.com or at participating theater box offices. With its initial release, Twilight leaped off the pages of Meyer's best-selling novel to become one of 2008's biggest box-office hits - and one of the highest-grossing female-directed films of all-time. The Twilight Saga films, released by Lionsgate's Summit Entertainment, grossed over $3 billion at the global box office, and the Twilight Saga books sold over 100 million copies around the world. In Twilight, Kristen Stewart and Robert Pattinson star as the endearing Bella Swan and the mysterious, handsome vampire Edward Cullen. As their worlds and hearts collide, Edward must battle the bloodlust raging inside him as well as a coterie of undead, led by the nefarious James Witherdale (Cam Gigandet), that would make Bella their prey. Twilight also stars Billy Burke, Peter Facinelli, Nikki Reed, Jackson Rathbone, Taylor Lautner, Kellan Lutz and Anna Kendrick. Twilight went on to win numerous awards at the 2009 MTV Movie Awards, including Best Movie, Best Female Performance (Stewart), Breakthrough Performance - Male (Pattinson), Best Kiss (Stewart and Pattinson), and Best Fight (Pattinson vs. Gigandet). Taylor Lautner was also nominated for Breakthrough Performance - Male, and the pop-rock band Paramore also received a Best Song from a Movie nomination for their song, "Decode." Said Tom Lucas, Fathom Events VP of Studio Relations. "Twilight was a once-in-a-generation supernatural love story that became a pop-culture turning point for teens and teens-at-heart. Fathom Events is thrilled to be celebrating the movie's 10th anniversary with Summit Entertainment by presenting it on the big screen this October." In addition to this two day only theatrical event, fans can relive the action, adventure, and immortal love story at home with the release of Twilight on 4K Ultra HD Combo Pack (plus Blu-ray and Digital) and all five Twilight Saga films with new collectible artwork on Blu-ray™ Combo Pack (plus DVD and Digital) on October 23 from Lionsgate's Summit Entertainment.